When Girl Scout Brownies (grades 2–3) take part in the Girl Scout Cookie Program, they’re helping lead the largest entrepreneurial program for girls in the world. How? By learning essential life skills, setting (and crushing!) impressive goals, and using their cookie earnings to go on epic adventures and make the world a better place—wow! Many of these incredible skills start with a Girl Scout badge, and we’re exploring all of them! Meet the Brownie badges Girl Scouts can earn during cookie season. 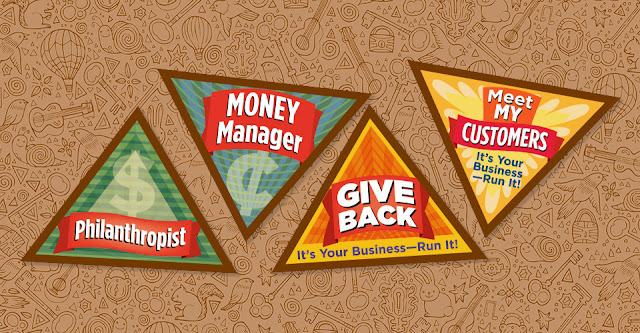 When earning the Money Manager badge, Brownies learn how to manage money wisely. Girls will try their hands at budgeting, saving, and learning the difference between spending wants and needs, like groceries for the family and school supplies. After a few practice rounds, Brownies will put their new skills to the test by creating a real-life budget. They’ll work with their troop to figure out how much money they need to earn through their cookie sales to reach their goal (or Take Action project) and then build a budget to make it a reality! Earn the Money Manager badge. Girl Scouts make the world a better place, which is why the Brownie Philanthropist badge is so important. Through this badge, girls explore basic human needs, such as clothes, food, and clean water, and then discover ways they can help provide those necessities for others who don’t always have access or are facing devastation after a natural disaster. One way Girl Scouts can give back? Through their cookie earnings, of course! So, by earning this badge, your girl is already building the foundation needed to plan a Take Action project with her troop. Earn the Philanthropist badge. By earning the Meet My Customers badge, Brownies will not only learn how to get to know their customers but also how to gain the confidence needed to sell Girl Scout Cookies to them. Girls will first figure out who their customers are—neighbors? Family members? Friends in the community? Whoever they think will be excited to help them reach their cookie goal! Then the troop will share its cookie pitch with each other; practice handling money and making change; and, most importantly, come up with fun ways to thank customers! Earn the Meet My Customers badge. The Brownie Give Back badge takes the lessons learned through the Philanthropist badge to the next level by helping girls figure out how to use their cookie earnings to give back. Through the Girl Scout Cookie Program, girls are running their very own businesses, so they’ll first research how other businesses in their community are already supporting causes they care about. Then the troop will get together and brainstorm ways to give back—does the local park need a fresh paint job, or does a school need more water fountains? Ideas can spark anywhere! These go-getters will start building a plan and putting it into action. Earn the Give Back badge. Has your Brownie earned one of these awesome badges, but you don’t know where to place it on her vest or sash? Our new visual guide to Girl Scout Brownie uniforms can help!